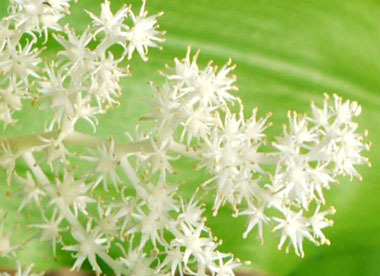 Overview: False Solomon’s seal (Maianthemum racemosum) and Solomon’s seal (Polygonatum spp.) are native woodland plants. Both plants produce long, arching stems. However, the flowering and fruiting characteristics are different. 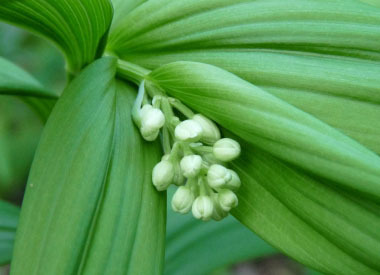 False Solomon’s seal produces creamy white flowers in fluffy clusters at the ends of the stems in spring. After flowering, small, pea-size berries develop that turn ruby red in late summer. 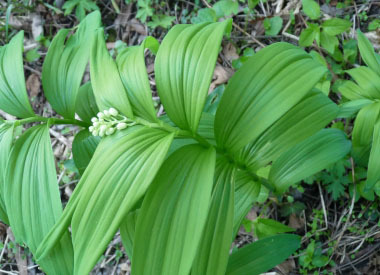 Solomon’s seal produces bell-shaped, yellowish green to greenish white flowers in May or June. The flowers hang down in clusters from the leaf axils. The flowers are followed by marble-size berries which turn dark blue in late summer. Never eat any part of it's look-alike, true Solomon seal. False Solomon seal is in the Asparagus Family (Asparagaceae) and the lily family. Distinguishing Features: This herbaceous perennial plant is unbranched and grows to about knee-high. The central stem is somewhat erect and ascending. 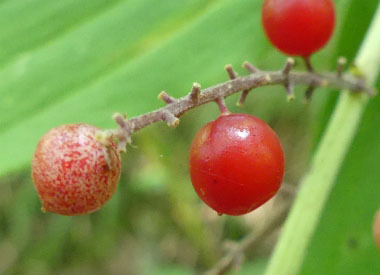 Flowers (then berries) occur at the end of the plant. Flowers occur in a plume-like cluster of minute florets and transform into a “bunch” of ruby red berries (although they do not all ripen at the same time). Flowers: Flowers are creamy white, small, and numerous. The stalks very short; in branched, egg or pyramid-shaped terminal cluster, strongly perfumed and showy when plants grow in clusters. Flowers become fleshy, round berries, showy, and measure 5 to 7 mm across. Fields of Nutrition has medicinal benefits and vitamin/mineral content of False Solomon Seal. Leaves: Leaves are broad, elliptical, 7 to 20 cm long, alternating along the stem in 2 rows, with strong parallel veins and somewhat clasping bases; margins are smooth. 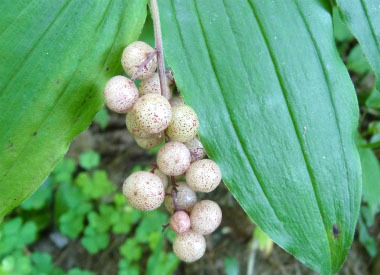 Height: False Solomon seal typically grows 60 to 90 cm tall and slowly spreads by thick rhizomes, often forming large colonies. 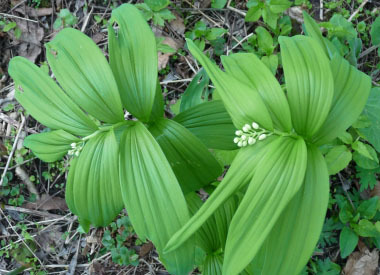 Habitat: This is a woodland plant that occurs in moist forests and along streambanks. They are widespread at low to subalpine elevations. They prefer well-drained soils that are neutral to slightly acidic. Some people have these in their garden as they can be grown from rhizomes or from seed (although the seed may take up to 18 months to germinate). 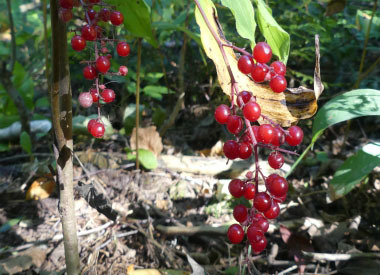 Edible parts: The berries are edible and somewhat bittersweet. (Large quantities can have a laxative affect.) 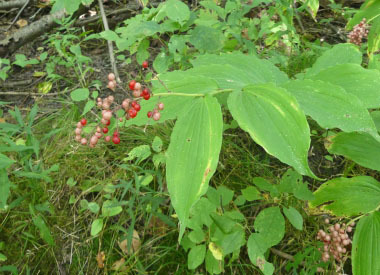 Young leaves are edible but relatively unpalatable. In traditional medicine the dried rhizomes can be used to brew a tea to treat coughs and constipation. In small quantities, cleaned rhizomes can be consumed. 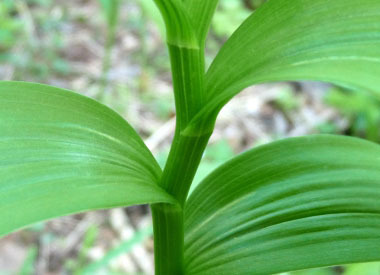 Similar plants: Solomon Seal, which is poisonous. Click here for more information. .